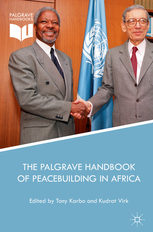 This handbook offers a critical assessment of the African agenda for conflict prevention, peacemaking, peacekeeping, and peacebuilding; the challenges and opportunities facing Africa’s regional organisations in their efforts towards building sustainable peace on the continent; and the role of external actors, including the United Nations, Britain, France, and South Asian troop-contributing countries. In so doing, it revisits the late Ali Mazrui’s concept of Pax Africana, calling on Africans to take responsibility for peace and security on their own continent. The creation of the African Union, in 2002, was an important step towards realising this ambition, and has led to the development of a new continental architecture for more robust conflict management. But, as the volume’s authors show, the quest for Pax Africana faces challenges. Combining thematic analyses and case studies, this book will be of interest to both scholars and policymakers working on peace, security, and governance issues in Africa.